Reading through the Rippers bestiary, I was disappointed to find no Ghouls - so I made my own. Since reading up a little on Persian mythology many years ago, I've always been quite partial to the Arabic ghul - not an undead, but an inhuman creature that feeds on the dead; that cannot starve to death but becomes increasingly emaciated; that has broad soft feet that don't leave footprints on sand; that can imitate a human; and that can turn invisible when standing still. My Ghouls come in three versions - Sated, Hungry, and Starving. Sated Ghouls are tougher, but the hungrier they get the faster and more vicious they become. They excel as ambush predators, often waiting underground or simply invisible in plain sight until their prey moves within reach. Split attributes are for Sated/Hungry/Starving Ghouls. Burrowing (4): Able to dig rapidly through dirt, sand, mud, and clay. Ambush (Stealth vs Notice) for +2 Attack and Damage (+4 on a Raise). Darksight: No vision penalty from darkness. Fade: In a turn where it takes no actions (including reactive or free actions), the Ghoul can choose to turn invisible, fading into the surrounding scenery. -4 to Notice and subsequent attacks - but if attacked the Ghoul must move to defend itself and therefore becomes immediately visible. 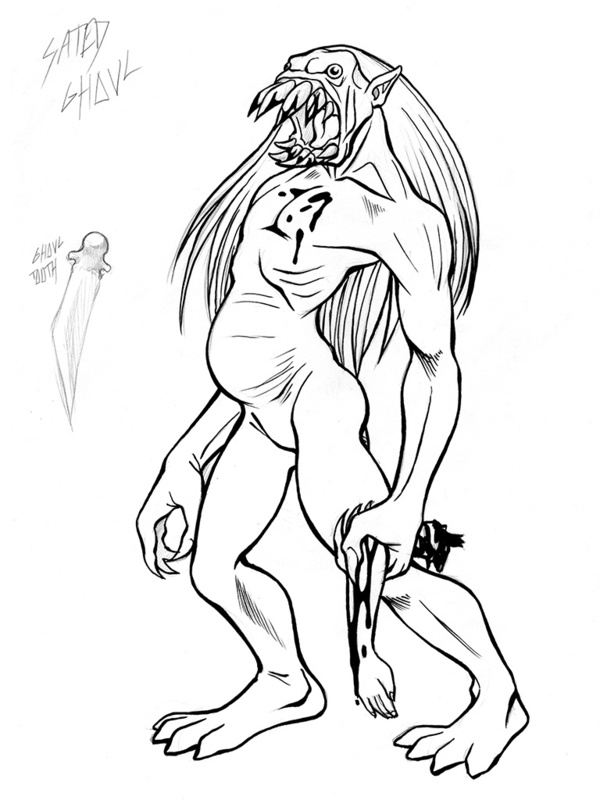 False Visage: The Ghoul can pull its face into the semblance of a human face, and imitate a human gait, but it will not stand up to close inspection; Notice at +2 will reveal its inhuman nature. Rubbery Hide: Armour +2/+1/0 (calculated into Toughness). Sand Feet: Stealth +2. No Pace penalty on soft sand, thick mud, or snow.